The box is worn, the dice are in good condition. Also a gambling sun catcher, in excellent condition. Vintage 6 Dice Size 5/8" Yellow ~ Bakelite? ~ Collectible for Games ~ 6 VTG Dice Appear to be Bakelite/ Not Experts ~ Shades of Butterscotch Color/Black Dots ~ 5/8" Square Size. 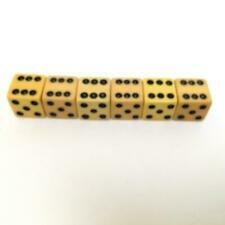 VINTAGE POKER DICE SET-butterscotch bakelite? Vintage LOT Gambling Travel Set Poker Dice Case GRISLOID HOYLE ON CARD GAF MORE. Condition is Used. Shipped with USPS First Class Package. They are flush inlaid spots, not painted. Red, Black, and Blue spots. In excellent condition as shown in pictures. Vintage Dice Cup Tooled Leather HORSES/BOOTS/ GUN Storage Bottom w/5 Poker Dice. Condition is Used. Shipped with USPS Priority Mail. They are flush inlaid spots, not painted. Red, Black ,Green ,and Blue spots. "ROD" on side two. In excellent condition as shown in pictures. Vintage Harrahs St. Louis - Riverport Red Dice. See all photos and my other listings. Traces of use ! traces caused by weather ! CONDITIONS Excellent condition. Please view all photos as we consider this part of our description . PAYMENT Payment through PayPal only. I list all items to stay up for the entire cycle unless it is a Buy-It-Now item. SHIPPING Item will be shipped via USPS within 1 business day of receiving payment. I will be glad to combine shipments when practical (do not like to ship heavy item with delicate item). But buyer should let me know they want items combined before paying. CANNOT COMBINE INTERNATIONAL SHIPMENTS. We will upgrade shipping upon request . RETURNS Items must be returned within 30 days of receipt for refund through PayPal. They are the rare playing card dice. rounding as you see in these dice. know Royal and Lucky Casinos used these in the 1950's. It is a complete set and for the. 2 1/2” x 2 1/2” x 2 1/2”. If you don't want. automatically applied. DO NOT USE BUY IT NOW OPTION. and added to the group. than two weeks. We will hold them no longer. found them. WILL BE CONSIDERED AS DESCRIBED. We will hold them no longer. As we have attempted. If you don't want. automatically applied. What you see in the photos is what you will be getting. We are not experts. DO NOT USE BUY IT NOW OPTION. Antique pair of milk glass dice. Nice weight.5/8 oz. They make a nice rattle when shaken.adds a nice authentic vibe. This has various different Riviera Dice and Texas Station N. Las Vegas Dice incorporated within. ~You are viewing high-contrast images and even minor flaws may appear pronounced and unsightly. Be sure to add us to yourfavorites list ! 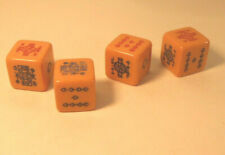 This is a vintage "Dice Sets", made in Japan. The original box measures approx. 3/4" by 3 1/4" and is in very good condition with some scattered wear from age. The set contains 5 ceramic bisque dice, made in Japan. .
7 Antique Vintage Wooden Tavern Dice, two sizes 1/2" and 1/3"
7 Antique wooden dice set. $Vintage Crisp - Bullseye - Celluloid Marked Casino House Dice This auction is for a set (2) vintage Celluloid Casino Dice. These dice are marked (on '6' pip) "C&D" which was the mark from Casino / House that they were made for. The dice have the Bullseye style pip pattern which is very desirable. These dice are in excellent condition and still have crisp (square) edges and corners. The dice are free from any cracks or dings and appear to be never used. Each Die measures approximately 3/4 inch across. DICE WERE USED IN ACTUAL CASINO PLAY AND ARE CANCELLED, NOT DRILLED AND HAVE MATCHING NUMBERS. Set of Vintage Amber Casino Dice * Combine Shipping! THE DICE ARE IN EXCELLENT CONDITION. THE DICE WOULD BENEFIT FROM A GOOD CLEANING, BUT I WILL LEAVE THAT UP TO THE NEW OWNER. THE STITCHING. ALL AROUND IS TIGHT, BUT IT IS GETTING FRAGILE WHERE COVER BENDS BACK TO OPEN THE CASE. This is a pair of Las Vegas Peppermill dice that were used in actual play. 2 pcs very rare diceKeychains from Communist era in Bulgaria - made of plastics !